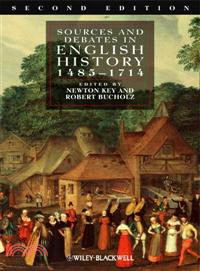 Designed to accompany the survey text Early Modern England: 1485-1714, this updated and expanded Sourcebook brings together an impressive array of Tudor-Stuart documents and illustrations, as well as extensive bibliographies and research and discussion guides. Editorial material introduces students to the critical context; chapter bibliographies and questions allow ready integration into classroom, and research and source analysis assignments. Newton Key is Professor of History at Eastern Illinois University. He has written articles on preaching, on feasting, on charity, and on provincial and metropolitan politicking in Stuart England and Wales. He is currently at work on a study of patrician/plebeian politics in seventeenth and eighteenth-century London. Robert Bucholz is Professor of History at Loyola University of Chicago. He is the author of The Augustan Court: Queen Anne and the Decline of Court Culture (1993) and, with Sir John Sainty, Officials of the Royal Household 1660–1837 (2 volumes, 1997–8). He has written articles on Queen Anne and the court. Preface and Acknowledgments to the Second Edition. Preface and Acknowledgments to the First Edition. 1. Social Order and Tensions in Tudor England. Social Order, Social Change, and the State. 2. Reviving the Crown, Empowering the State: the Tudor Challenge. Edward IV, Richard III, and the Re-Assertion of Royal Power. Claiming the Throne: Richard III, Henry VIII, and the Pretenders. Henry VIII and Cardinal Wolsey. Tudor Revolutions in England, Wales, and Ireland?. 3. The Old Church Defended and Attacked. The Old Church Remembered, Criticized, and Defended. Protestant vs. Catholic under Edward VI, Mary I, and Elizabeth I. 5. Masterless Men and the Monstrous Regiment of Women. Rough Music, Food Riots, and Popular Rebellions. Good Wife, Bad Wife, Poor Wife, Witch. Poor laws and the Reform of Popular Culture. 6. Early Stuart Church and State. Divine Right of Kings and Ancient Constitutionalism. The Crisis of Parliaments in the 1620s. The Constitution Reformed or Deformed?. 7. Civil War and Revolution. War and Reaction in the Three British Kingdoms. Constitutional Experiments and Radical Solutions. Radicals, Sectaries, and their Brave New World. 8. Religion, Restoration, and Revolution. Dissenters, Catholics, and the Church of England. James II, William of Orange, and the Revolution of 1688-89. 9. Later Stuart Politics, Thought, and Society. Landed Interest versus Monied Interest, and the Reformation of Ideas. Bibliography of Online Document Archives.